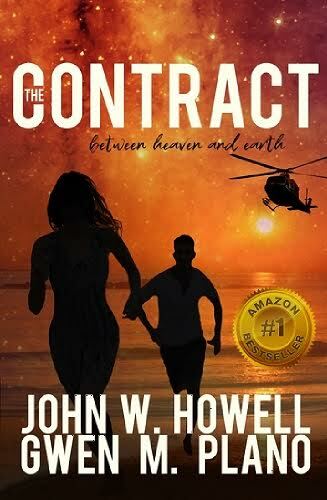 The Contract between heaven and earth is a collaborative effort with author John W. Howell. The book is now available for purchase through Amazon. John is an experienced thriller writer (this is his fifth book) and I am a novice. I've learned immeasurably from John's tutelage and in the process found that I love fiction and thrillers. ​Have you wondered about your purpose in life? Have you experienced Déjà vu or met someone inexplicably familiar? The Contract is a story of two people who had more questions than they had answers, and yet they pursued love and were instrumental in preventing the ultimate destruction. Their life purpose was beyond what they could have imagined. Because they trusted, however, they helped save the planet. ​The earth is threatened with a catastrophic event which could destroy all life on the planet. The elders in heaven decide that intervention is essential. They create a binding contract with two wise souls who are assigned to go to earth to avert the disaster. The Contract follows Brad Channing and Sarah O’Brien as they separately and then together attempt to foil an assassination attempt that also includes global dominance. Much of the action takes place on a military base, where it is not clear who can be trusted and who should be feared. Great read! The Contract brings love, politics and cosmic evolution together in an interesting mission to thwart present-day evil. Uncanny how it relates to current news headlines! This story grabbed me from the first word on the first page. Imagine that humans make contracts before returning to Earth to complete lessons or missions? While this book is fiction, many of us believe this is exactly the case. The Contract is the perfect blend of thriller and spiritual - between the yin and yang. It is a fast-paced, riveting and rewarding read. I hope we will see more collaborations from these two authors. If you love a good thriller with the stakes so high it makes your pulse pound, while gaining spiritual insights, you will love this book! ...this captivating and absorbing book, The Contract deftly combines the thorny elements of a gripping thriller with the more muted ingredients of a love story. That is not an easy thing to do—especially when there are two authors mixing the literary chowder. However, Gwen Plano and John Howell are experienced and gifted story tellers who clearly work well together. Both of them recognize the critical elements of pacing, character development, conflict, active voice, and evocative description. You get all of that in The Contract, as well as a highly compelling story. One of the most fabulous books you’d ever read. A broad, vast, and wild imagination that takes you to spaces while you’re sitting in your own place. Highly recommended! Glad I got my copy and had the privilege to read it. Very talented authors. Thanks for sharing the talent. This is a story that not only entertains and is exciting, but it also makes you think about coincidences. If you love a book with a lot of action, intrigue, a bit of romance, and thought provoking-- this is the book for you. It is a perfect blend of insight and excitement that I highly recommend! I especially enjoyed the blending of genres in this book - suspense, political intrigue, and romance (but not overdone). ...Both Brad and Sarah have endured hardships in their lives, and made it through the other side because of their strength and determination, qualities they certainly need to survive the threats they're facing. They're instantly likable and well-developed characters. This action-packed story moves along at a brisk pace, and the trustworthiness of certain characters comes into question, leading to some surprising twists along the way.